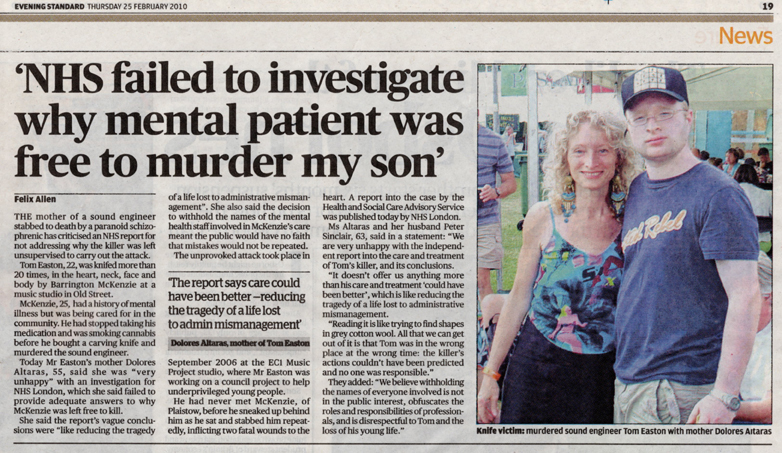 On 25 February 2010, NHS London published the report of its independent investigation into the care and treatment of Barrington McKenzie, the man who stabbed Tom to death – and the reason why the Flavasum Trust was set up. Below is a response from Tom’s family. Mr BM’s mental ill health was identified as the only causal factor [of the killing of Tom-Louis Easton by Barrington McKenzie], and this linked with the four contributory factors of the [North West Newham] CMHT [City Mental Health Trust] workload and staffing, internal communication within the CMHT, the length of time without regular anti-psychotic medication at the onset of mental ill health and Mr BM’s continued use of cannabis combined to contribute to the homicide taking place. We are deeply unhappy with the report and its conclusions. It doesn’t offer us anything more than that McKenzie’s care and treatment “could have been better”, which is like reducing the tragedy of a life lost to administrative mismanagement. We believe that its failure to come up with any satisfactory answers is a result of the way such events are investigated, leading inevitably to generalised conclusions that don’t meet our needs, or those of the public. Reading it is like trying to find shapes in grey cotton wool. All that we can get out of the report is that Tom was in the wrong place at the wrong time: McKenzie’s actions couldn’t have been predicted and no one was responsible. Should we be satisfied with such an outcome? Is this all we can expect from a wealthy, sophisticated and so-called civilised society? On behalf of Tom’s family, we asked that NHS London publishes the independent report it commissioned from HASCAS without anonymising the names of the people who were responsible for the care and treatment of Tom’s killer. We believe that withholding the names of everyone involved during the time Tom’s killer was being treated by the mental health services is not in the public interest, obfuscates the roles and responsibilities of professionals, and most importantly is disrespectful to Tom and the loss of his young life. We recognise that anonymisation is a relatively recent NHS London policy, but it is not a legal requirement and can be set aside. Our request was refused. We also expressed our concern that lessons are learned and the recommendations made in the report are acted upon. NHS London explained that they have internal procedures to ensure that the implementation of all recommendations made in independent reports is properly monitored by PCTs, and that NHS Foundation Trusts learn lessons from previous mistakes. We do not believe that we, or the public, can be assured that recommendations have been fully implemented without the transparency and openness offered by independent and external reviews. We asked that HASCAS reviews progress after six and twelve months and to report back publicly. Our request is under consideration.